Matt Bors has been named this year’s John Fischetti Editorial Cartoon competition winner given by the Columbia College in Chicago. Bors’ winning image portrays two men sitting outside a trailer listening to a radio account reporting that for the first time in the United States, children of color will be the majority. 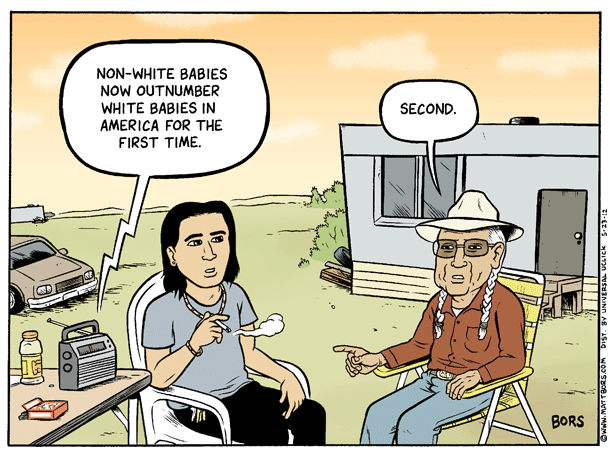 “Second,” says the Native American man. Matt draws for Medium.com, NSFWcorp Magazine and is syndicated through Universal Uclick. Each year, the competition honors a single image, published in the the previous calendar year, that meets the highest standards of editorial cartooning and captures the zeitgeist of a particular period of American history. The judges awarded honorable mentions to Steve Breen of the San Diego Union Tribune and Nick Anderson of the Houston Chronicle, both former Fischetti winners and winners of the Pulitzer Prize for Editorial Cartooning. Bors was a 2012 Pulitzer finalist and Herblock Prize Winner.